One of my favorite pick up and play games has to be Arkanoid, and if you follow our Warp Zone section, I gave the NES version very high marks last year. Doughlings: Arcade from Hero Concept is a fresh take on the classic paddle and ball brick-breaker format. The concept is nothing new, and in fact has been a staple on consoles since Breakout launched on the Atari 2600 and even Mario got in on the action with Alleyway on the Game Boy! But, should you fork over the $6.99 asking price for more of the same? Yes! Yes, you should. A game like this hardly needs a story to be fun, but there is a light one included. A meteor crashes into the planet and its inhabitants – the Doughlings, are poisoned and turn vicious. Morpheos, a Doughling scientist who is unaffected by the toxic fumes, develops a formula to heal them, which constitutes striking them with a ball. If you’ve ever played the aforementioned games, you know exactly what to expect. Morpheos acts as the paddle and you bounce the ball between yourself and the bricks, which in this game are your brethren Doughlings. If the ball gets past you, you lose a life along with any current power-ups you may possess. In most of the 90 stages, your goal is to clear the screen by healing all of your companions. You’ll need to hit them a multitude of times depending on their color. Once you do manage to conquer a stage you can return to any of the previous ones to improve your high score and even take a crack at the online leaderboard. Along with its quirky charm, the heavy use of power ups and special items is what makes the game so much fun to play. Tiny thumbs-up icons fall when healing a Doughling. Collecting ten of these will activate ‘Show Off’ mode, allowing you to use your power-up. Collecting a falling DNA tube will transform you into one of six additional personas. Each of these has their own special ability and their own Show Off move. For instance, turning into the Robo persona magnetizes the ball and his Show Off is a destructive laser beam. The Gunner persona allows you to fire shots into the Doughlings, and his special move is to slow down the game. Your personas and special skill are both on timers and don’t last too long. You aren’t introduced to all of the personas at once, as they slowly unlock as you complete stages. Each level contains three stars to gather, which turn into currency that can be spent to increase your power-up strength and duration. You also get three lives and if you lose them all, you simply have to restart the level. When healing a Doughling, they will fall and you’ll slow down and lose points if they manage to strike you. As you progress, more types of Doughlings and obstacles are introduced and the game gradually becomes more difficult. The real challenge is balancing between grabbing the special items while keeping track of the ball. The game is colorful and visually reminds a lot of a Puyo Puyo, Dr. Mario, or Mean Bean Machine. There’s a neat stage select map that shows your path and the different lands you can traverse. The game features electronic music that is perfect for a puzzle game like this, but it is rather repetitive and the song doesn’t change until you reach a new area. There is an announcer that adds very little to the game and I found it unnecessary, but certainly didn’t deter me from playing. For the low $6.99 price, I’d hardly expect incredible music and graphics, but overall the presentation is solid. The only real special feature is the level creation mode. In order to make full use of this, you should play through the game first, as you need to unlock everything to use them in this mode. The creative types, or those dreaming of a career in video games may get some enjoyment out of this. Like Picross S, this is a perfect simple game to have on your Switch, although it’s not nearly as addictive. It’s still a great game to unwind to for 20 or 30 minutes at a time. The game is challenging and yet easy to pick up and play. 90 stages is a lot of content for a game under $10, making it one of the best values on the Switch. Doughlings isn’t going to make any waves in the gaming world, but Turkish developer Hero Concept delivered a solid title, especially since it has been many years since any notable Arkanoid clone has been released. This classic formula equates to fun gamers of any age. 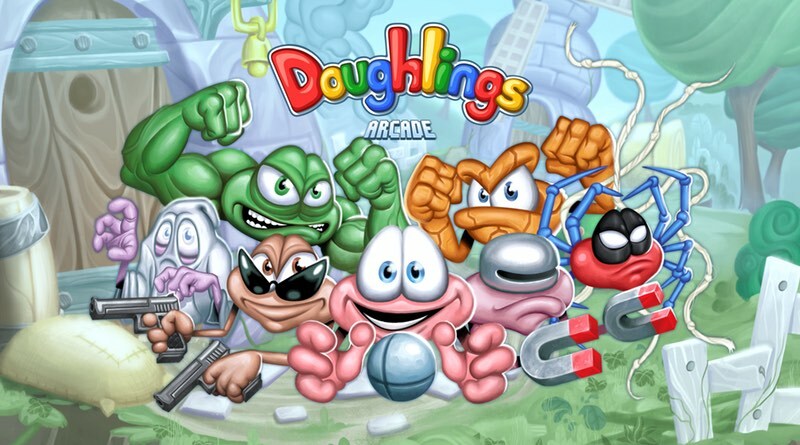 Doughlings: Arcade was reviewed using a final retail Nintendo Switch download code provided by the publisher.